I was logging into PayPal to buy something yesterday (some clear mascara for a 13 year old.. it’s a long story) and I saw that my most likely time to make a purchase in 2017- was between 5:30am and 6am. Now, given I generally didn’t get up until 6:30… this presented me with some useful data: I was incredibly susceptible to buying things in bed, before my brain is properly ‘with it’. For me – the purchases were often techy/info things, (with the odd detention-averting parenting purchase) and other pretty random stuff – apparently vital at the time. Some I got refunds for because (on closer ‘awake’ inspection) I didn’t need them. The odd thing was a stroke of genius. Like the Groupon I got on a flotation tank session. A great purchase that my semi-conscious mind decided was just the ticket that morning. But that was a rarity. Most of it was rubbish/useless/tat. I stopped taking my phone to bed. That lead me to think about ‘buying stuff’ as a concept. Do the things we buy make us happy? but actually the studies on buying habits tell us something very interesting. Cornell University (in particular the very cool Prof. Gilovich) looked at happiness with regard to different types of purchases. In essence it came down to THINGS vs EXPERIENCES. Even the white knuckle stuff; bungee , parachute , car racing, abseiling. Experience happy points come in three parts.. The anticipation, the planning, the imagining etc..
And the reminiscing – especially with others that we involved. This can be relived with photos and video, tagging, messages etc.. The initial excitement (and little rush of happiness) fades as we adapt and ‘having’ that thing becomes the new norm. The opposite happens with experiences. They actually IMPROVE with time. Each telling of the story tends to become fonder, as do the benefits we perceive from having been there. Experiences really are the gifts to ourselves that keep on giving. We tell tales of times that we DID things, or LEARNED things or were part of something. We love hearing stories of other people’s adventures; vicariously we get a little taste of what they had – maybe get inspired to do something similar. We rarely share stories of times we acquired ‘a thing’ and if we do, we’re met with a ‘that’s nice’ at best …and even envy/jealousy.. So our thought for today: next time you find yourself about to click BUY NOW on that new gadget or handbag… work out – is it going to make you happiest? Or could that spend be allocated to an experience that could last you a lifetime? And of course we couldn’t end this email without inviting you to have a memorable experience with us? 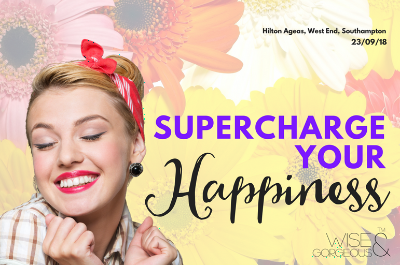 We’d love you to spend the day with us on 23rd September at the gorgeous Ageas Hilton Ballroom – when we’ve planned the ULTIMATE experience called Supercharge Your Happiness! Be inspired, learn, sing, dance share delicious food – and have your red carpet moment. Learn the secrets to Supercharging Your Happiness… forever! Tickets are selling fast – and we’d love to welcome you personally.